Experimenting with different types of resume. Clicking on the text above will take you to a resume presentation of sorts. Saturday October 23, 2010, was Portland’s 4th annual Thrill the World Zombie Walk. Around 200 participants performed to Michael Jackson’s Thriller in Pioneer Courthouse Square, followed by a Zombie March through the streets of downtown Portland, finishing up by Saturday Market in the waterfront park. Thrill the World had comparatively modest beginnings. On Sunday, October 29th, 2006, Thrill Toronto’s 62 zombies officially set the first Guinness World Record for “Largest Thriller Dance!” (in one location). Thrill The World 2009 had 34 nations and more than 250 cities from all around the world participating. As a side effect of the 2009 Thrill the World, the events raised over $100,000 USD for 80 charities. The weather was kind and stayed in the drizzle range for the dance and most all of the walk. There were 200 participants for the Thrill the World dance and I have to guess four to six times that many for the walk. There was a wide range of ages, from retired folks to little kids, all having a blast playing Zombies, including whole families. One of the things I love about this city, is the people of Portland, who never pass up the opportunity to dress up and go out and play. I am so looking forward to next year. The city of Portland, OR does love it’s pirates. On any given day you are likely to see one walking down the street. But, on September 20th, at the annual Pirate Festival the city showed the world just how much it loves pirates, by breaking the Guinness Book world record for the most pirates gathered in one place. THE CURRENT RECORD IS NOW BROKEN!! 1655 pirates (including Lauren and Hannah) at the Portland Pirate Fest 9/20/2009 Arrr matties! The weather was beautiful and the festival had such a warm friendly atmosphere, it made for a perfect day. It was a family friendly event with lots of kid-centric activities. Today was the opening day for the Green Line train in Portland, OR public transportation system. It is a big deal here. Especially for anyone who rides the 72 bus on a regular basis. The 72 is the bus line that services 82nd Ave. 82nd is a very busy shopping and business route, and even with the buses running every 15 minutes, it has been over crowed for a long time. The Green Line is an electric train which will run on brand new tracks parallel to both 82nd Ave and highway 205, from the Clackamas Town Center Mall. At the Gateway Transit center the new track connects with the old and the Green Line will be on the same route with the Red and Blue lines running into downtown. At the transit Center downtown, the Green will again pick up on new tracks running over to Portland State University. They have included plenty of free parking at each stop, which is really great. and rode the Green Line downtown. Trimet has estimated that over 40,000 people rode the Green Line today, and I have to say a good time was had by all. 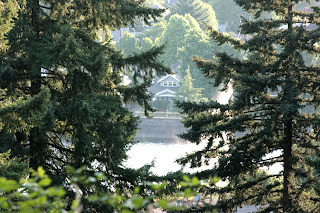 Mt Tabor is one of the many beautiful city parks in Portland, OR (info on Mt. Tabor park). It is a mountain, or specifically an extinct volcanic cinder cone right in the city proper. The above photo is the view of Mt. Tabor from the Ross Island Bridge. In 1894 the city built the first two of four open water reservoirs on Mt Tabor. On the fourth, we watched the city fireworks from the top of Mt. Tabor. There is a road and parking right near the top, with a short, but uphill walk to get to a vantage point looking down Hawthorn Ave., straight to the river, where the fireworks are shot off from a barge. It is a mountain forest escape right in the city. We had a nice picnic before the fireworks show, and afterwards, while we waited for the traffic to clear out, Lauren and Hannah showed off their mad crazy hooping skills. Tuesday, as I was inching my way home on SE 82nd Ave, my mind wandered onto the fact of how really nice drivers are in Portland. I have driven all over the country, in many large cities and, have to say, I’ve never experienced the civility that Portland offers. The drivers for the most part are considerate of everyone around them. Merging is never an issue because everyone takes turns. I smile every time I am coming back from the West side on the Ross Island bridge. three very heavily traveled roads become one right at the start of the bridge and could be an incredible bottle neck at rush hour. Yet the people just all take turns, even stopping so that the next car from the other road gets in on their “turn”. Very nice! I have yet to be honked at by another driver, and very seldom hear a car horn. This is especially true downtown. The typical city traffic noise is barley noticeable. As a teenager I honed my driving skills on the streets of Chicago. The first rule of driving in Chicago is you are going to encounter honking and hand gestures, if you have done anything wrong or not. It doesn’t take long driving around Philadelphia to understand how the City of Brotherly Love has one of the highest homicide rates in America. Driving there raised my anxiety to near homicidal levels. I think that the only thing I can say about driving in either New York or Washington, DC, is just believe everything you have ever heard. It is as bad as they say. So Tuesday evening, when I sat down to read the news the first headline that caught I eye was “Road rage survey: Portland drivers nation’s ‘most courteous'”. WOW! Not earth moving, but serendipitous, none the less. Almost 100 teams compete (including local, national, and international teams) with heats of four teams competing every nine minutes. These races are held on the Willamette River (near the Hawthorne Bridge), in boats graciously provided through the Portland-Kaohsiung Sister City Association.